Namami Ganges - A Disastrous Program? After taking decision to contest election from Varanasi, PM Modi in almost all his political public meetings said that MAA GANGA has called him to bring back old glory and clean water for devotees taking bath in thousands daily due to faith. A scheme with name NAMAMI GANGES was also re-launched with budget of app 40,000 Crores. Earlier also, during the tenure of Late Rajeev Gandhi, such scheme was launched, which had swallowed app 20,000 Crores, but the flow remained same with filth and garbage. 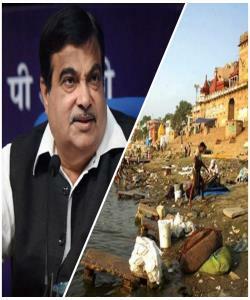 After 4 years, even after change of GAURD from Ms Uma Bharti, due to non performance of scheme, to Nitin Gadkari, known for his fighting spirit, the Maa Ganga, is as it is as it was years ago. All the money allocated are utilised for other purposes, except for cleaning purpose. All involved in the scheme are working day and night to prepare documents, many study groups formed, a lot of researchers are working on this. This has strengthened more, with the report that out of Rs. 4,800/- Crores allotted last year an amount of Rs.3,800/- has been spent on meetings, seminars and tours by concerned persons. When Delhi and entire north India is under record temperature, sources say, meeting has been fixed to discuss methodologies at Sri Nagar, J&K. Surprisingly, no one has objected of meeting far away from Ganga Ji or bank of Ganga Ji.